Exactly as it says, very lightweight. Love that it is bagless, easy to empty and clean. Have a large home with no carpet and can run this easily without my back or wrist crying before it's done. Would recommend. I love this vacuum. It's very lightweight, my children can use it easily to clean their rooms. It's a great purchase. Don't let the size of it discourage you. The lightweight vacuum has surprising suction. It cleans even small carpets very nicely. Love this little vacuum. I bought it for my son who lives in a 2 bedroom dorm and he said it is perfect. It's lightweight, doesn't take up much room, and we use it on rugs and bare floor. 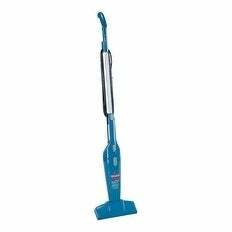 I bought this Bissell FeatherWeight Bagless Stick/Hand Vacuum in Blue to pick up the dirt and pet hair on our hardwood floors that our broom and Swiffer ALWAYS leave behind! The UPS guy hadn't even left our drive completely and my husband was already inside setting it up (SUPER SIMPLE...just a couple of clicks). It did the job perfectly! I would definitely recommend it if you need something for those lighter pick-up jobs and the attachment is AWESOME as it gets in the corners, tight spaces, the tops of the baseboards and it saved my back as I used it to vacuum out our bottom kitchen cabinets! I'll definitely be ordering another one just so our daily floor sweeping will be done faster and it's definitely worth the price. Love this little broom. Lightweight yet very powerful. Does a wonderful job on rugs,hardwood or tile. And you can't go wrong with theBissell brand. And the price makes it the perfect purchase. love it, it is feather weight and it vacuum good too. Just got it yesterday and absolutely love it. Picks up stuff on the kitchen and bathroom floors great. Love it. Quick and easy set up and clean up! Have not used but it looks like pictures. Once I used it. The vacuum was good enough for my son to navigate. I am excited about him helping around the house. I enjoy using this product. It is light weight and has powerful suction. It also has an attachment that makes cleaning out the sliding glass door tracks in my living room easy. If I could wish for anything more it would be a slightly longer cord. I am pleased with this product and would recommend it to anyone in need of a tool for quick non-tiring cleanups. This little vacuum does its job! It was very easy to assemble, is lightweight, and has great suction. I also love the color ("turquoise" blue)...Hope to be able to make the same claims about its cleaning power after I've used it several times (will update later)...! Very light in weight. Easy to handle. A quick picker upper. I use on my carpet and wood floor. "Is this cordless? Ihave a wood floor and pet hair. Would it work okay for that?" It’s not cordless. We have wood/tile floors, and a few rugs with a German Shepherd. It works great and gets everything. "What are the amps on this vacuum?"